When I write stories, my instinct is to write about how I feel. How I feel varies with my mood and whatever I am experiencing at that time. The result is work that depicts a variety of emotions and experiences. In his book "Down Not Out", Chris Cipollone describes human life as being made up of different seasons; some seasons marked by change, others by calm and stability. This really rings true for me. When I go back and read work that I haven't touched for a while, I can often recall the kind of season I was in when the ideas first came to me. Maybe it was a busy season. Or maybe it was the calm after a storm. Maybe I was feeling encouraged and motivated. Maybe I had been having a hard time, and I just wanted to lock myself indoors and write my heart out. That being said, I notice that much of my most recent writing (ie. within the last year or so) comes from a place of deep sadness. I am in a season of persistent despair. I wish I could just shake it off and feel better. I wish it were that easy. When I am depressed, my perspective becomes very narrow and I struggle to empathise with others. I fill up with so much resentment, and yet I also curl inwards, becoming more anxious around others. I can't bear to look people in the eye, out of both anger and shame. Writing when I feel that kind of despair and think such painful thoughts produces work that makes for a really painful read. Not because the words aren't constructed in a beautiful way - they may be. Things can be beautiful and horrible at the same time. But because the reader is forced to join me in my suffering, it's an unpleasant read. It hurts to feel the pain of depression, and it hurts to see things from that perspective - that's why depression is so debilitating. That can be so hard for the reader to endure. The reader must have a motivation to endure it, otherwise they simply won't. When we read stories, unless, perhaps, we are literature academics or ardent hipsters, we tend to want to enjoy the experience! We want the experience to be a positive one. Especially if our own circumstances are unpleasant. I suspect that's why so many of us crave books that engross the reader. They offer us a momentary escape from reality. Another important factor that might make us want to read the words of a despairing person is if we can relate to them. I've talked about sad art on this blog more than once before (eg. here and here). James Blake released the song, "Don't Miss It" on his YouTube channel in May this year. I think it's fair to say that it's a tragic song; with its heartbreaking and repetitive piano chords in the background, heavily distorted vocals, and lyrics that tell of that narrow perspective that comes with depression that I was talking about earlier ("Everything is about me / I am the most important thing"). I love this work primarily because I relate with the emotions behind it. I understand why some have dismissed the song as "sad boy" (see open letter from James Blake on this below), or just avoid it because it's "depressing". Being depressed is very unpleasant. Many respond in the same way to Radiohead or the Channel 4/Netflix TV series, Black Mirror, both known for their tragic themes, and both artistic ventures that I have greatly appreciated over the years. At the end of the day, sometimes it only hurts to join someone in their suffering. Even those who have gone through similar low points in their life and have come out the other end may feel averse to sad art for the same reasons. I know that sometimes, I'm not in the mood to listen to Radiohead or similar. It would be too heavy for me in that moment. It would bring those feelings back. Open letter from James Blake in response to public reception of his song, "Don't Miss It"
Sometimes, I get the urge to write when I'm recovering. I see my mood as akin to a sine wave (see diagram at the top), with rises and falls over time. When I'm on the rise emotionally, I perceive hope more readily, and my writing presents a perspective that doesn't hurt so much for the reader to enter into momentarily. Nevertheless, I still think it is valuable to depict sadness. After all, it is a part of the human experience, familiar to us all. Stories with no suffering or loss, at best, appear alien or utopian to us, and at worst, come across naive. I just feel it is best to not write when I am at my lowest. Rather, I want to be able to think back to those sad times from a better place mentally. When it is a past experience and not a present reality, then I can see outside my bubble, see that things exist beyond my despair. I'm a hurting man. 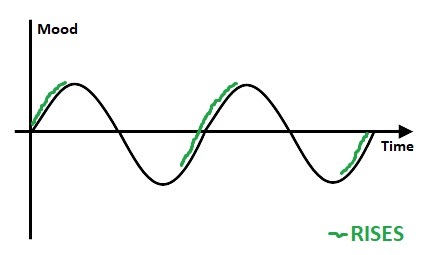 I'm on the bottom half of the sine wave, but I'm on one of those green lines. I'm on the rise. That's why I can write this at this current time. Though I'm still hurting, I have a perspective that can appreciate the good things that exist alongside the bad.